Martinez will not appear in an exhibition games. He is to throw on flat ground for the next week before moving to a mound. St. Louis has not announced a timetable for Martinez’s arm strengthening program. The pitcher received a platelet-rich plasma injection two weeks ago, and manager Mike Shildt said treatment improved Martinez’s condition. 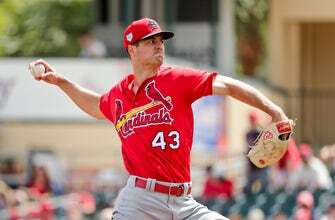 A 27-year-old right-hander, Martinez was the Cardinals‘ opening-day starter last year but did not pitch for St. Louis from May 8 until June 5 last year because of a strained right lat muscle, then was out between July 19 and 30 because of a strained right oblique and between July 30 and Aug. 21 because of a strained right shoulder. Noah Syndergaard allowed two hits in 5 2/3 shutout innings with five strikeouts and two walks. Robinson Cano hit his second home run, a two-run drive off Gerrit Cole, who allowed four hits in 4 2/3 innings. Derek Fisher drove in the Astros’ run. Joey Rickard had a two-run single for Baltimore. Andrew Cashner allowed three runs, five hits and two walks in 3 2/3 innings, leaving him with a 8.64 ERA in three starts. Marcus Stroman, scheduled to start Toronto’s opener, struck out six in 4 1/3 innings and allowing one run and two hits. Eric Sogard had a two-run single. Blake Swihart had two doubles and two RBIs for Boston, which has lost seven straight. Tate Matheny, a son of former Cardinals catcher and manager Mike Matheny, had a two-run triple. Nathan Eovaldi pitched three innings and allowed his only run on Buxton’s homer.